This is a cabinet designed to hold sheet music. Materials are ebonized Walnut with Anigre and Maple venneers. Inlays of Mahogany, Walnut and Anigre. The finish is lacquer . The side panels have anigre veneer with inset moldings and diamond inlays. These pictures are in my home before delivery. 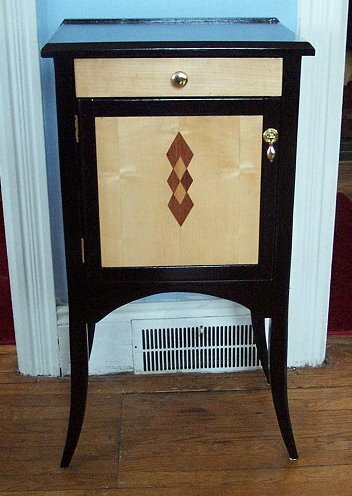 The cabinet will reside next to a black baby grand piano. Here is the cabinet in it's new home. Here's the second spritely little cabinet in a series a designed to hold sheet music.